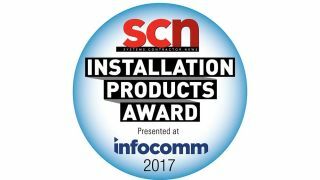 The finalists for the 2017 SCN/InfoComm Installation Product Awards have been revealed. The awards showcase the most innovative commercial AV products of 2016. The ballot of finalists was chosen by an independent panel of judges by narrowing down the field of submissions to no more than four products per category. Now it’s up to you, our readers, to select the most innovative product in each category. The ballot will remain open until May 5, and winners will be announced in June during InfoComm 2017 in Orlando, FL. Bose ShowMatch DeltaQ array loudspeakers feature the most versatile DeltaQ design, optimized for permanent installations or portable applications, with field-changeable waveguides (offering 70/100-degree horizontal coverage) in compact enclosures that can form DeltaQ, constant-curvature, or “J-shape” array configurations. ShowMatch loudspeakers are available with 5-, 10-, or 20-degree vertical coverage options. An integrated rigging system allows for arrays up to 24 boxes. A matching single 18-inch subwoofer enclosure can be integrated for extended low frequency support. The MJF-208 is the newest and smallest member of Meyer Sound’s acclaimed MJF line of high-output, self-powered stage monitors. Although sharing the same minimal footprint as single 12-inch designs, MJF-208 features dual 8-inch drivers to provide greater cone surface for extended headroom and higher undistorted output. Linear response delivers exceptional gain before feedback while the wide, uniform horizontal coverage allows performers to move freely side to side while remaining in the sweet spot. Shure’s Microflex Advance is a portfolio of premium networked ceiling and table array microphones, audio interfaces and control software for enhanced AV conferencing in premium meeting spaces. MXA is an elegant, versatile, and scalable solution for AV conferencing applications within government, education, events, and meeting sectors. Leveraging technologies including Shure’s proprietary Steerable Coverage, onboard IntelliMix Digital Signal Processing Suite and a unique toroid polar pattern, users have best-in-class flexibility and control for unmatched “invisible” audio. The NEXO ID Series are low-profile, high-output loudspeakers designed for theaters, auditoriums, fixed installations, and touring. ID24 (InSpace Definition) full-range compact speaker uses twin 4-inch drivers in a V formation combined with an HF compression driver on an easily rotatable horn. It also includes two low-profile subs, the ID S110 (1x10-inch) and ID S210 (2x10-inch). The ID24 can be mounted vertically or horizontally, providing four different directivity options per cabinet. These Dante Adapters allow analog legacy equipment to be seamlessly connected to and controlled by a Dante Digital network via "Dante Connect" or "Dante Via" software (available from Audinate). With one Dante RJ45 input and one or two channels of balanced line, XLR outputs, using and configuring your non-Dante enabled legacy equipment is as easy at less than $200 each. The unD6IO-BT is a two-gang Bluetooth-to-Dante wall plate. Any Bluetooth device can be paired with the unD6IO-BT and its audio is then available on a Dante network. Network control of pairing, setting a Bluetooth-friendly name, and other Bluetooth-related capabilities allows the unD6IO-BT to be easily controlled by control systems or DSPs. Unlike consumer Bluetooth interfaces, the unD6IO-BT's control capability makes it easy to accommodate the specific requirements of the venue and system user. Prism 0x0 is the most powerful Dante-enabled open architecture processing node on the market. Providing cost-effective processing, mixing, and routing for Dante-enabled endpoints, Prism 0x0 easily and quickly adds customizable DSP capacity to existing Dante-enabled systems. Additional features include flexible mounting solutions, convenient powering over Ethernet, a complete toolkit of highly optimized DSP modules in Composer, and the ability to integrate ARC wall panels, ARC-WEB, and third-party control protocols. The Yamaha MRX7-D processor features the innovative Yamaha Speech Privacy system and Dugan auto-mixer (increased from 16 to 24 channels). Multiple Dugan auto mixers are possible, making it easy to handle conference rooms with many attendees, and open microphones. The built-in AEC (Acoustic Echo Canceller) function removes echo problems that often occur during remote conferences. It is suitable for a wide range of conference room applications, hotels, banquet rooms, and schools where clear, high-quality sound is a must. The RackWell Stage Pocket moves rack-mounted digital mixers, stage boxes, and snakes out of the equipment rack and puts them in the stage floor, allowing vertical access to I/O connectivity directly under the Stage Pocket lid, while eliminating patch panels and above-floor cable runs. Updated design features include a protective neoprene equipment cover, and additional combination knockouts to extend digital throughput under the stage, instead of across it. The height-adjustable DynamiQ RPS-500 mobile AV cart is an ideal solution for large displays and interactive touchpanels. The patented spring-weighted, easy-glide mount allows feather-light adjustment of the display height for maximum usability in the classroom or collaborative workspace. The all-steel DynamiQ RPS-500 supports displays up to 198 pounds and also provides a custom mounting kit for the Cisco Spark Board. Custom options, including powder coating and branding, are available. Middle Atlantic’s Universal TechBox (UTB) discreetly mounts AV equipment anywhere it’s needed —under an existing table surface or to another out-of-sight surface. It's perfect for storing all-in-one presentation and control solutions suitable for small- to mid-sized huddle spaces, conference rooms, and other collaboration environments where space may be at a premium. The low-profile, easy-to-install design provides the flexibility to expand from one to two rack spaces, while also providing small device mounting options. The Salamander Low Profile Cabinets (12-inches deep) for AV components deliver streamlined solutions to fit any décor, providing sleek presentation and functionality. Key features include premium, eco-friendly materials; ergonomic touchscreen interaction; ADA compliance; storage versatility, with vertical 3U rack, shelves, integrated speakers, and active cooling options; simple installation with hollow wall anchors; integrated video mounts, for displays (up to 90 inches), with no need to reinforce wall structure or run in-wall cables; and the cabinet ships assembled within days of ordering. This unique height-adjustable wall mount with 20 inches of travel for IFPs solves a large problem in collaborative spaces: how to install mounts in a minimally invasive way where existing whiteboards are installed. The motorized column attaches to the wall below the marker tray via z-clips, allowing the mount to clear the tray while in motion. This mount also eliminates "over-the-board" brackets and transfers the weight of the IFP directly to the floor. Middle Atlantic Products Proximity Series In-wall Box is an innovative in-wall component, cabling, and power storage offering that answers the need for reliable systems support at the display. Featuring patented Lever Lock mounting plates, integrators can easily mount devices of any size in the box along with power and cables. The result is an all-in-one system that ensures ultimate reliability while keeping the display snug and flat against the wall for a clean aesthetic. With the DS-VW775’s tool-less micro-adjustment, it is faster and easier for integrators to align displays, creating exceptional video walls. With reusable spacers, an easy hang wall plate, and a lighter design, one person can manage installation, reducing time and costs. The DS-VW775’s quick-release pop-out lever also eases serviceability and prevents display damage, particularly in recessed wall applications. And, internal cable management ensures a clean design. It can be used in portrait or landscape orientation. Salamander’s fully adjustable Electric Lift & Tilt Mobile Stand is designed to work with the Microsoft Surface Hub and other interactive/touch screens. Key features include durable components: powder coated steel, stable structure, high performance locking casters, Linak motor fully adjustable motor control, and large handles; wide base stance for stability and accessibility, and is ADA compliant; and compatible with a range of accessories: equipment storage, lap top shelf, vertical U-rack, retractable power cable reel, wireless remote control with memory, customized road case. The next-generation Leyard DirectLight LED Video Wall System is a family of seamless, ultra fine-pitch LED video wall displays. Available in 0.9, 1.2, 1.5, and 1.8 millimeter pixel pitches, Leyard DirectLight features a 27-inch cabinet with a 16:9 aspect ratio. Leyard DirectLight includes a mounting system for wall mounting and is fully front-serviceable. With an off-board design and redundant power supplies, Leyard DirectLight is less than 4 inches deep when installed. LG’s Dual-View Flat OLED slim, dual-sided display with perfect blacks can uniquely swap and mirror content on each screen with the press of a button. The space-efficient design provides customers three installation options: ceiling suspension, wall-mount, and floor stand. Each screen boasts 4K Ultra HD (3840x2160) resolution, showcasing a more lifelike viewing experience to capture consumer attention effortlessly. High-performance SoC and internal memory enable perfect UHD-synced playback without a PC or media player. UN551S is a large-screen display with 0.9mm of inactive border around the panel. A new build allows the glass of the panel to go all the way to the edge of the display, reducing the image gap between neighboring panels. Partnered with professional grade S-IPS anti-glare panel technology, this allows for less color shift in off-angle viewing and more color uniformity. The display is ideal for broadcast, command and control centers, retail, and more. Camellia was the first sub-1mm pixel pitch LED display to reach the broadcast market, perfect for applications requiring extremely close proximity viewing and off-axis camera angles. Its 4K resolution at 165 inches diagonal has a minimum viewing distance under one meter. Utilizing SiliconCore’s custom driver chip and Common Cathode technology, Camellia produces four times the pixel processing speed of other LED displays while reducing LED driver numbers by more than 75 percent and power consumption to 30 percent. The REALiS 4K501ST Pro AV LCOS Projector combines native 4K resolution of 4096x2400, up to 5,000 lumens, and Canon’s LCOS Technology with AISYS-enhancement for brilliant, high-brightness and detailed image reproduction. The REALiS 4K501ST also offers a Genuine Canon 4K lens and a robust collection of advanced image adjustment and professional install setting features. At only 39.6 pounds, it is one of the most compact, lightweight, and powerful high-brightness native 4K projectors available. Casio’s LampFree XJ-F210WN Advanced Series Projector provides high brightness, 3,500 ANSI lumens in WXGA resolution. Its hybrid laser and LED light source eliminates the need for expensive and hazardous mercury lamps while delivering a 20,000-hour estimated operating life. Two HDMI inputs and a RGB input provide connectivity with all current display technology without the need for switching cables. Additional features include a Powered USB port, dust-resistant design, direct light control, and powerful 16W speaker. The Epson Pro L25000U installation laser projector leverages a sealed optical engine with laser light source and 3LCD technology to deliver 25,000 lumens of color brightness and 25,000 lumens of white brightness and up to WUXGA resolution with 4K Enhancement. It features include a wide array of future-proof 4K-ready powered lenses with lens shift and lens memory, 360-degree installation flexibility, diverse connectivity options, and up to 20,000 hours of virtually maintenance-free operation. Sony expanded its range of laser light source projectors by introducing two new LaserLite models. They are aimed at making laser technology more cost-effective for the installation market. Designed for commercial applications, including classrooms and meeting rooms, the new VPL-PHZ10 (WUXGA) and VPL-PWZ10 (WXGA) projectors bring the benefits of laser technology—image quality, color reproduction, and virtually zero-maintenance—to customers who previously may have only been able to experience lamp-based projection. Da-Lite’s Parallax surface with ambient light-rejecting technology is now available in a slim, thin-bezel frame for upgraded aesthetics. Each layer of Parallax plays a role in preserving the image that is reflected back to the viewer in high ambient light environments. Some layers absorb light while one special layer is shaped like a microscopic saw-tooth that blocks light from above resulting in the preservation of high-contrast, bright images in brightly lit environments. Draper’s Profile+ fixed screen sports a 0.5-inch thin bezel frame. Available up to 30 feet wide, the Profile+ provides the industry’s biggest flat panel look. The sliding hook-and-loop surface attachment system is incredibly simple. Optional LED lights frame the Profile+ with thousands of color possibilities. Profile+ also comes with a Zero Edge option—again, up to 30 feet wide—and is available with all of Draper’s Optically Seamless, ISF certified, 8K-ready TecVision formulations. Torrent Large Venue ElectriScreens feature a streamlined 9.25-inch-tall by 12.5-inch-deep case with a simple four-point mounting system to accommodate a wider range of ceiling depths. Offset interior endplates and a self-finishing ceiling flange create clean lines and eliminate the need for additional trim, molding, or installation time. Best of all, Torrent can be configured with any of Stewart’s flexible front- and rear-projection screen materials (except Silver 3D), including the new Phantom HALR. VIO 4K (Ref. V701) is a powerful multi-format converter offering ultra-low latency. It includes three slots for optional I/O interfaces and features up to nine inputs and three scaled outputs. Video expansion modules supporting formats up to 4K60Hz 4:4:4 are now available and can either be equipped with HDMI 2.0 and DP 1.2 input/output plugs, or convert HDMI 2.0 or DP 1.2 to either Quad-Link 3G-SDI or 12G-SDI, and vice versa. The VLX Series 4K AV-over-IP transceiver solution consists of two wall plates (VLX-TCW2V-C, VLX-TCW2H-C) and a box version (VLX-TC1-C). The VLX Series has low compression (8:1) with low latency (25ms) to create a visually lossless image, and features advanced video wall modes of up to 8x8 and image rotation for portrait video walls. All VLX units have USB 2.0 over IP and Dante option to further increase the flexibility of the overall system. Blackmagic Design’s Teranex AV is the world’s first standards converter designed specifically for AV professionals with 1089 broadcast quality standards conversions. Teranex AV features 12G-SDI and HDMI 2.0a inputs, outputs, and loop through; along with AV-specific features such as ultra low latency that goes as low as 67 milliseconds, internal still store and live freeze modes, and Hi-Fi audio inputs for professionals working on live, staged presentations and conferences. Kramer's VCO family of solutions is a web-based, video content overlay solution that overlays one, eight, or 16 independent graphic images to any number of displays over standard HDMI in full HD 1080p/60Hz or 1920x1200 resolution. The easy-to-use and feature-rich software includes design, schedule, and display capabilities with static or animated images with full transparency control. This allows the display of individual targeted messages for each and every display in your installation. Belden 4K UHD Media Cables were designed specifically for optimal 4K HDBaseT transmission up to 100 meters. Interoperable across 4K equipment, the unique, sleek design makes it easy to bend and fit in small spaces. The single overall foil shield provides 100 percent protection from noise; eliminating the need to terminate individually shielded pairs or a braid. Twenty-five percent smaller than cabling like Cat-7A, 4K UHD Media Cables withstand 45 pounds of pull tension. Chief PAC526 Series In-wall Boxes have been upgraded with high-performance, isolated ground outlets featuring SurgeX non-sacrificial multi-stage filtration and surge protection. Powered Chief boxes create increased revenue opportunities for dealers and peace of mind about expensive connected equipment degradation. As AV equipment shrinks, walls are becoming a better option than racks. The PAC525/526 power series is specifically rated (UL2416) to mount AV components. Choose between two, four, or six receptacles and black or white flange. The Invisible Waves RF-Vue is the world's first tablet-based RF spectrum analyzer for pro audio installation, offering full-featured spectrum analysis with a convenient touchscreen interface. The revolutionary software includes unique frequency coordination tools, custom color-coded markers, interference detection, and the ability to "touch-to-listen" to easily, audibly identify signals. The RF-Vue is available for use with your own Windows tablet, or ships with a Windows 10 Dell tablet, and offers a frequency range up to 2.5GHz. Middle Atlantic’s DC Power Distribution is the industry’s first universal DC power solution, according to the company, solving power outlet challenges and eliminating messy, space-consuming wall warts and other power clutter. Available in 45W DC compact and 125W DC 1RU systems, it fits into any rack unit, small enclosure, or wall box. A color-coded screw terminal connector platform and polarity labeling for its 5V, 12V, 18V, and 24V outputs makes installation intuitive; integrators simply trim leads to length. The ATUC-50 Digital Discussion System gives you reliable, crystal-clear speech reproduction from a scalable, feature-rich system that couldn’t be simpler to set up and use. Offering plug-and-play functionality via standard category cable, 24-bit digital audio, four-track recording, bi- or trilingual interpretation, and optional remote web operation from a computer or tablet, the ATUC-50 is equipped to handle any number of applications—from small meetings to conferences with up to 150 participants. Crestron Mercury transforms your meeting rooms into highly effective collaboration spaces. Combining all must-have conferencing features in one easy to use device, Mercury enables people to work together and share content irrespective of location. Full-duplex audio and optional HD video afford a gratifying and productive meeting experience for all participants. Mercury is secure, easy to deploy, easy to manage, and protects your investment by providing room usage data as part of a complete managed enterprise. The VC-B20UA is composed of a USB camera and a USB speakerphone. The HD PTZ USB camera has a USB 3.0 video output interface and is equipped with an image sensor with 1080p/60Hz output resolution. The camera covers a wide shooting angle and achieves high-speed, quiet, and precise positioning with smooth PTZ operations. The camera is applicable for videoconferencing in a huddle room or medium-sized conference room. The SR598-HUB mounts 55- and 84-inch Microsoft Surface Hubs at Microsoft’s recommended 55-inch height. ADA-compliant and UL rated to 300 pounds, the cart offers vertical adjustment for positioning at any height up to 60 inches. Rolling casters provide smooth movement while the locking feature offers a stable foundation for touch applications. Integrated cable management ensures a quick, neat way to hide cables. Corner bumpers are provided for protection and an optional keyboard tray can be added. The AT-UHD-HDVS-300-KIT provides AV switching, USB and HDMI extension, plus system control to integrate PCs, USB webcams, and USB mics in huddle spaces and meeting rooms for presentations and teleconferences. The five-input AV switcher with USB hub utilizes a single category cable connection for Ethernet-enabled, HDBaseT extension to the receiver with additional HDMI input and USB hub. The receiver also provides PoE for remotely powering the AV switcher and a 4K/UHD HDMI output for displays. Avocor F-7510 is an integrated media platform that enables smart and effective collaboration in today’s modern workplace or learning environment. Combining Microsoft Windows 10 operating platform, 4K, and Avocor InGlass touch technology, delivering a true tablet-like experience. InGlass delivers superior, responsive touch, using a pen, finger, or palm. The F-7510 is software agnostic, so integration is possible with multiple collaboration tools to create the ideal platform. It also features a built-in Intel processor and Intel-approved OPS slot. Vivitek’s NovoPro allows users to instantly connect their device via a Wi-Fi and start sharing content immediately. With high-quality streaming, up to 1080p/WUXGA at 60Hz, NovoPro allows up to four people to present on one display while connecting up to 64 users through cross-platform mirroring. Moderation and on-screen annotation functionality allows unified control and collaboration in real time. Affordable and reliable, the NovoPro features free presentation and collaboration software usage and upgrades. Cynap is a unique “all-in-one” collaboration solution, that enables users to share, display, record, and stream all commonly used media simultaneously—providing greater versatility during lectures, meetings, and collaborative sessions. With flexible integration options allowing for simplified room design, innovative control capabilities that work with all legacy setups, and comprehensive BYOD for both wired and wireless connections, Cynap provides virtually unlimited options for sharing information and collaborating in groups in the same room and remotely. Montage is a wireless presentation system that allows multiple meeting attendees, both in room and remote, to cast their screen to a meeting room display simultaneously. Remote attendees can present wirelessly and communicate via video and voice. Montage is available as a hardware solution and software. Designed to scale, Montage is built on peer-to-peer WebRTC framework to ensure high-quality video and with minimum load on network, unlike bandwidth-hungry TCP solutions. Solstice transforms ordinary meeting spaces with enterprise-ready collaboration that drives better meeting results and ROI. The Solstice Pod enables multiple participants to stream content wirelessly to a meeting room display, and now with the addition of Solstice Multi-Room, users can collaborate among multiple meeting locations. The Multi-Room capability signals a watershed because it unlocks collaborative, multi-threaded content sharing for meetings that involve participants spread across multiple locations and geographies. Prysm Application Suite is the only enterprise-grade solution that delivers a seamless user experience from individual work on mobile devices to group collaboration using in-room displays to drive decisions and turn them to profitable outcomes. Prysm’s device-agnostic software is complemented by Prysm’s interactive displays. Its ability to share and mirror content and actions like annotations, snapshots, or content edits to different locations and devices means all meeting participants are fully active and engaged. U-Computer allows the Utelogy AV Platform to integrate a PC into an audiovisual system and treat it like any other device including monitoring and controlling the PC. This is a significant and revolutionary as more software and computer capabilities are integrated into today’s modern AV system. Soft-conferencing and dialing, application launching, rebooting, volume control—all with diagnostics and monitoring—are some of the features that can be integrated into next-generation AV systems. BrightSign’s new line of digital signage players shipped in September 2016 with state-of-the-art technology updates and a sleek new industrial design with a very slim profile less than 1 inch in height. All Series 3 players now support H.265 (HEVC playback) and HTML5. The XD and XT models offer a hardware-accelerated H.265 decoding engine capable of 4K HDR 10-bit video playback. The XT line offers PoE+ and HDMI In for Live TV playback of HDCP-protected content. Intevi provides solutions where IPTV and digital signage converge. Its solutions allow users to distribute video over multicast IP networks (QAM, ATSC, and generic H.264), and provides branding capabilities as well as a range of plugin widgets (e.g. weather, transportation, news, and sport). Its intuitive user interfaces for both owners and administrators allow management of TV channels, displays, branding templates, active widgets, messages, and alerts, including scheduling of all functions. LG’s 86-inch Ultra Stretch Commercial Display features a unique 58:9 aspect ratio that displays dynamic content and doubles as digital décor. Featuring 500 nits brightness, UHD resolution (3840x600) and an IPS panel, this seven-foot display offers crisp, clear pictures. The picture-by-picture (PBP) feature allows up to four different pieces of customized content displayed in landscape or portrait installations and easy editing through the LG SuperSign Software creates a seamless process for displaying content. Sharp’s PN-R series includes some of its most sophisticated, professional-grade LCD monitors. They can be installed forwards, backward, face up, or face down at almost any angle. With a slim bezel of 7.8 inches on all sides, the monitors are the first to incorporate the Mini OPS design, brought in collaboration with Intel, and include certifications for Extron and Crestron Connected software to remotely control and manage each monitor via a LAN network. The TSW-1060 delivers the ultimate touchscreen experience in a space-saving design featuring a brilliant, high-definition 10.1-inch capacitive touchscreen display with Smart Graphics and five soft-touch buttons. PoE connectivity and a range of mounting options make installation a breeze for both new and retrofit applications. It includes the abilities to control functions using voice commands, view security cameras and other video sources, communicate using built-in intercom and phone capabilities, and browse the internet. Utelogy is software-defined audiovisual control, management, analytics, support, and document storage for corporate, higher education, and government/emergency operations environments. It’s a non-proprietary solution that runs on any network and any server, virtual or otherwise. It delivers an as-a-service solution for conference rooms, classrooms, and anywhere else AV technology is deployed. Utelogy eliminates large upfront hardware costs while making it easy to deploy a high-tech AV system that people enjoy using. RoboTRAK is an IR lanyard-based system that automatically follows the instructor as they walk around the presentation area of a classroom. The ultra-smooth pan and tilt motion ensures presenter tracking is natural and effortless, enabling the presenter to focus on teaching, not technology. RoboTRAK is comprised of a RoboTRAK IR tracking camera and a presenter lanyard that lasts up to 40 hours on a single battery charge. RoboTRAK pairs with any Vaddio RoboSHOT PTZ camera. HELO makes recording, streaming, and delivering H.264 as easy as pushing a button. Delivering unprecedented flexibility, connectivity, and scalability, the cost-effective standalone device provides a range of workflow options that meet the needs of live event production, house of worship, webcasting, corporate communications environments, and beyond. It features 3G-SDI and HDMI inputs and outputs, the power to handle up to 1080p 60Hz recording formats and a simple web-based UI for easy configuration and control. Fulcrum Acoustic’s Passive Cardioid Technology, the basis for its Cardioid Subwoofers product line, overcomes the excessive rear low-frequency radiation that is a major performance challenge of many loudspeakers. Passive Cardioid Technology achieves impressive directional control mechanically within the enclosure in less than half the space required for active cardioid array systems. This allows for cardioid performance in applications that might not otherwise have the budget or space to accommodate an active cardioid array. ListenWiFi is an assistive listening solution that leverages cloud technology and the ubiquity of wireless devices to deliver personalized audio in noisy video environments. In venues offering ListenWiFi, patrons connect to the ListenWiFi network via a free app and stream TV audio in their native language to personal smartphones. ListenWiFi is easy, affordable, scalable, and ideal for fitness centers, employee/student lounges, waiting rooms, and venues featuring multiple screens that want to enhance patrons’ listening experiences. The LG Dual-View Curved Tiling OLED’s beautifully curved design uses slim tiles to form customizable displays that link combinations of up to eight tiles together. These displays boast eye-catching dual-sided views, offering an efficient use of space for customers’ multimedia experiences in commercial environments. Each screen boasts 4K UHD (3840x2160) resolution, showcasing more lifelike pictures to capture attention effortlessly. High-performance SoC and internal memory enable perfect UHD-synced playback without PCs or media players.